I don’t know anything about turkeys. I have never had turkeys. I like turkey on the grill. I like roasted turkeys. I have never in my life met a turkey. Turns out turkeys are pretty cool. I really like the noises they make. Henry makes this weird sound that is really more vibration than noise. And “the girls” chatter and coo. They certainly add to the farm. And as a matter of fact, we might just try to hatch some baby turkeys. Why not? A warm welcome and howdy-do to “Henry and the girls”. Good job, Sissy! Just tell them to keep away from Laura. Oh definitely try and hatch our turkey chicks. 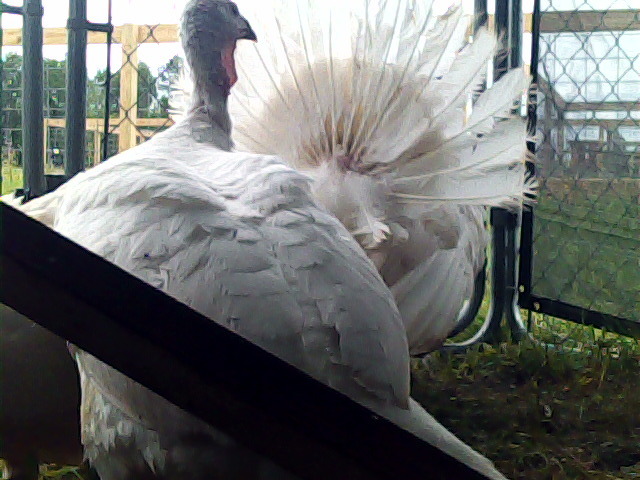 We are first time keepers of turkeys on our smallholding and this year our trio have hatched out three clutches. It has been a steep learning curve – it is not that it is difficult, I just didn’t realise how careless mother turkeys could be and we lost a few. However, there were 9 little chicks in the last batch they hatched on Saturday and they are all safe and warm in the brooder now. Interesting! I have heard guinea hens are terrible mothers too. I have a Rhode Island Red that is sitting on guinea eggs now and I have turkey and guinea eggs in the incubator. I figure if I get chicks, I’ll let the chicken raise them and see if she is any more competent than the other birds. Or should I just take them away all together? Any thoughts?